Sometimes as an elk bowhunter, you must rely on blind faith to get you through challenging times. Staring out the window of the small plane, it was obvious that catching our connecting flight was going to take a miracle. A lengthy delay and heavy rains were trying their best to thwart an otherwise easy flight for me and a pair of friends who just happened to be on the same plane. They were headed to the same state to bowhunt elk. Although we wouldn’t be sharing camp, it was obvious we were going to share the “joys of flying” together. As the engines started to hum, the clouds broke and a rainbow appeared just off the edge of the runway. Despite the conditions, I couldn’t help but smile with optimism. Maybe things were going to work out after all. Two hours later, my enthusiasm faded after running the length of O’Hare International Airport (backpacks included), only to be told we had missed our connecting flight to Idaho. Despite losing a day’s worth of bowhunting, David, Trace and I still managed to laugh over a hot meal and some good company. The next day we touched down in Boise, and went our separate ways. I headed off with a close friend, and my buddies were meeting up with a “friend of a friend” who was going to show them a good public land spot to hunt. Then it hit me — the realization that, despite our faith and efforts, someone might go home with an elk tag still in their pocket. I mean let’s be reasonable; three friends, taking three elk on public land with archery equipment isn’t exactly the norm. It’s a pipe dream, really. The only thing the three of us shared, and would be returning home with, was our faith. That much I knew. But, like so often is the case, I know very little. Looking at my phone, it was obvious that some really bad weather was approaching the area my friend and I planned to hunt. So much so that setting up basecamp proved impossible due to the amount of snow that had fallen. One ill-advised turnaround attempt resulted in unloading a trailer full of ATVs and hunting gear in an effort to get out of the area safely. An hour later, Marcus (my bowhunting brother) and I were headed to safer ground. Pulling the plush sleeping bag up around my neck, I eased the seat back and prepared to spend the night staring at the snow-capped mountains through the window of a truck. We would set up basecamp in the morning after the storm had passed. I couldn’t help but wonder what those mountains held for us. I thought about my friends. I thought about the odds of success for all of us. I struggled with doubt as my eyes became heavy and I drifted off to sleep. Little did I know that my buddies were facing their own obstacles. Having never hunted elk and certainly never hunted the high country, my friends were shocked when they learned that their “friend of a friend,” the guy who would walk them through their first elk hunt, wouldn’t be making the trip. Ultimately, an illness in the family had forced him to return home. Before doing so, he pointed them toward a large mountain range and simply said, “There you go.” Fueled by nothing more than faith and an eagerness for adventure, David and Trace set out to find an elk. The next morning, I awoke to the warmth of the September sun making its way through the windshield. Eager to get the day started, I dug my way out of the warm cocoon and stepped into the cold, Idaho air. Basecamp went up pretty smoothly, and after some breakfast, Marcus and I began the tedious challenge of glassing elk in spotted patches of snow that had already began to melt at the feet of the fiery sun. Having spotted a few bulls here and there, we decided the next morning we’d hunt a familiar spot that overlooked a large canyon. History has showed us that bulls typically liked to push cows through this area at first light, so the idea seemed plenty solid. Reaching the head of the ravine, Marcus let out a loud bugle in hopes that something would respond. Immediately, the timber echoed with a single, growling response. Judging from the sound, the bull had already made his way very close to our position. Shouldering my pack, I quickly scampered down the rocky hillside searching for a place to hide. I found none. The bull was inside the timber, just beyond a small field that separated us. Fearing he would spot me if I attempted to cross, I cautiously sat down amongst an outcropping of rocks, just beside a very large, very old log. Shaking my head in doubt, I elected to stay put. As I knocked an arrow, I was shaken with a thunderous bugle rung in my ears followed by the heavy steps of a moving herd. Then, I spotted her —a lone cow making her way out of the dark timber and across the field some 70 yards away. Figuring the bull would follow suit, I quickly ranged the distance and adjusted my single-pin sight. Almost immediately, she turned directly toward me and began to walk. My heart sank into my boots. I imagined her walking close enough to spot me and then running away, taking my bull with her. I struggled to remain hopeful, but within moments she was there. My jaw dropped to the rocky, sage covered mountain when she walked by me at only 5 yards. I could hear her lungs fill and spew air with each step as the saliva fell from her mouth. I expected a blessed hunt, but I honestly couldn’t believe what I was seeing. She was clueless to my presence. Almost as quickly as she walked out of my line of sight, my eyes caught movement on the field edge. His large, dark rack seemed to pierce through the light colors of the field, and his growling bugle crashed off of my camo profile. Suddenly, my mind began to scramble in anticipation of what route he would take. Peering through my rangefinder, I quickly started to scan several shrubs and a few scattered pine trees that littered the open field. Turning my sight dial to 30 yards, I watched as the bull made his decision and headed on a parallel course just below the cow’s path of travel. It took only a few seconds for the bull to cover enough ground to be within shooting range. The instant his eyes disappeared behind one of the trees I had ranged, I quickly hauled my bow string back and settled into my anchor. He never missed a step. I watched as the bright, florescent-green sight-pin tracked his massive chest. Suddenly, for no reason, he stopped. His dark-brown racked silhouetted against an amalgam of white, orange and green. It was like something out of a painting. Then, without much thought as to how, my bowstring leapt forward. My eyes caught a flicker of bright orange as my arrow slipped through him like the preverbal hot knife. The bull immediately turned and began to run back from where he came. But, after a short jaunt, he turned and stopped almost in the exact spot the cow turned and headed toward me some 65 yards away. When the author sent his text out across the Idaho landscape, he didn’t know it at the time, but something very special was happening. Not knowing what had just transpired, the bull stood as a large patch of crimson flowed down the side of his creamy-brown hide. Knowing the distance, I quickly knocked another arrow, adjusted my dial and came to full draw. In the same instant that my arrow took off, the bull collapsed and rolled a short distance before stopping. It was over. Or so I thought. With unsteady legs, the bull fought to his feet. I was already at full draw and preparing for a quartering-away shot. Again, our actions coincided with one another. I touched off the release-aid the instant he leapt forward; my arrow quickly going inside and out of his right hip. I watched with mixed emotions as the bull quickly made his way out of the field and into some heavy brush and rock-strewn cover. Shaking with a load of adrenaline, I quickly rose to my feet and tried to fathom what had happened. Did I really just accomplish what had eluded me for a lifetime? Faith whispered, “Yes.” But lurking doubt screamed, “No!” Then, a thunderous crash broke me from my trance; echoing down the canyon and onto the valley floor. The author’s hunting partner, Marcus Flesher, smiles next to his freezer-filling cow elk. I turned to find my partner, who had lured the bull into my lap with perfectly timed and executed bugles, only to see him pumping his fists like he had just won the lottery. In his eyes, he had. Not only did he witness my first bull kill, but he played a vital role. And on top of that, he managed to fill his freezer with the lone cow that acted as bait during the entire process. But it didn’t end there. After tears, hugs and handshakes, I texted my buddies (hundreds of miles away) and shared my images of success. I was shockingly greeted with a picture of a great bull one of them had arrowed not minutes apart from mine. Even more surprising was that the next morning I was greeted with another image of another great bull. That made three bulls and one cow within a span of about 48 hours. Who would have believed that? I know four guys who did. While all of us are men of faith, we are not perfect. But we believe in a higher power and strive to be more like him. We often place our lives at the mercy of our beliefs. A week earlier, sitting on that delayed flight, there is no doubt we were all hoping, praying and believing in the same things. But could we all get what we wanted? Sometimes you do. Sometimes you don’t. Either way, you have to believe. This hunt was no exception. Expecting to be helped by a local hunter, David and Trace were left alone in the Idaho backcountry after a family emergency tore their would-be help away. Knowing very little in the ways of elk hunting, the two kept their faith and did what any bowhunter would do. They believed and embraced the challenge. 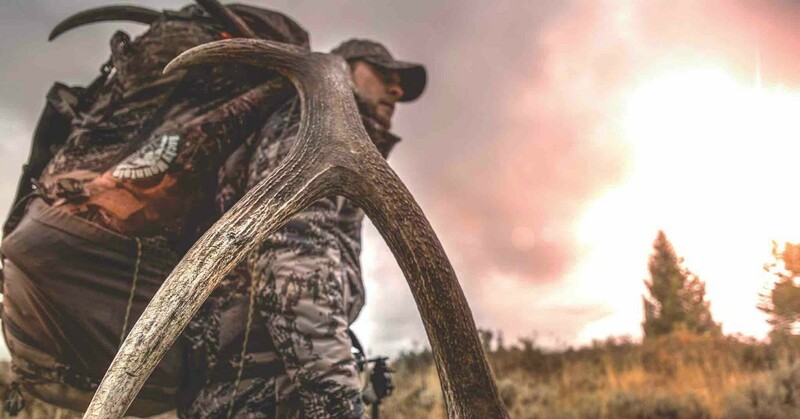 With nothing more than a little direction and camp on their backs, they managed to accomplish what roughly 15 percent of bowhunters experience in Idaho; archery success on a bull elk. And, while it was initially surprising to us all, on the plane ride home I realized that this was exactly how this trip was meant to play out. After all, when you take four bowhunters, scatter them across the Idaho backcountry and they each have faith in their back pocket, who knows what can happen, even if sometimes that faith is blind. Hundreds of miles away, David Miller and Trace Butcher were letting faith lead them and finding success of their own. When it comes to preparing for a backcountry elk hunt there are two things that I feel are the most important pieces of gear. One will get you to where you want to be and the other will help you seal the deal after you get there. First, is a stair climber. This doesn’t need to be a fancy $1,000 unit. In fact, I’ve trained for my last two hunts using nothing more than a basic (hydraulic) unit. The key, though, is incorporating a weighted pack. Stair climbers, in my opinion, are superior training tools because they more accurately represent the type of hunting you’ll be doing in the mountains. Before each hunt I had worked my way up to 60-minute sessions with a 45-pound pack on my back. Trust me when I say I was well prepared for what the mountains threw at me. Second, is an accurate shooting bow. Sure, there are plenty of bows on the market that fit this bill. However, when heading West, I like a bow with at least a 32-inch axle-to-axle length. I also want a bow that pulls smooth and has a forgiving brace height. Shots can run the gamut from ultra-close to long pokes. Therefore, I like to squeeze every ounce of accuracy and forgiveness I can out of my rig. The author with his 2017 Idaho “blind faith” bull.